The Greater Chicago Food Depository, Chicago�s food bank, is a nonprofit food distribution and training center providing food for hungry people while striving to end hunger in our community. The Food Depository distributes donated and purchased food through a network of 650 pantries, soup kitchens and shelters to 678,000 adults and children in Cook County every year. Last year, the Food Depository distributed 66 million pounds of nonperishable food and fresh produce, dairy products and meat, the equivalent of 135,000 meals every day. 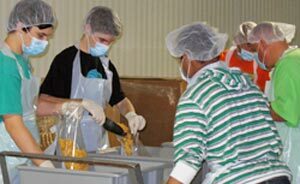 Food Repacking: Opportunities include repacking bulk products to individual/family sizes, assembling boxes with assorted food, checking expiration dates and labeling and gleaning products. The Food Depository can accommodate individual volunteers and large groups during repack sessions. We offer sessions Tuesdays through Saturdays. Loading Dock: The Food Depository ships more than 150,000 pounds of food every day. Volunteers are needed weekday morning hours to help load trucks on the shipping dock. Volunteers must be at least 16 years old and able to lift up to 50 pounds. Ages 13-15: one adult supervisor required per four youths. Ages 5-12: may volunteer during Kids Days only. We encourage each volunteer to bring an item of nonperishable food. The most needed items are cereal, quick oats, pancake mix, canned vegetables, soup, stew, tuna, canned fruit, rice, beans, peanut butter, jelly, mac �n� cheese, pasta, pasta sauce, and personal care items such as laundry detergent, soap, shampoo, and toothpaste. All repacking sessions take place at the Greater Chicago Food Depository warehouse at 4100 West Ann Lurie Place, 60632. On weekday morning and afternoon sessions there is non-metered, non-permit parking surrounding the building on side streets, Karlov and Keeler. Our parking lot will be available for Wednesday evening and Saturday sessions. Volunteers can sign up for events directly from the Greater Chicago Food Depository calendar, located here.